Six brothers set out to find their fortunes, each guided by his work in the family bakery. This is the story of how those brothers have carried the lessons and work of their youth into successful enterprises that all lead back to home. Their story begins in a bakery, and if you know Harvard, you know which one. The Stricker family and its Swiss Maid Bakery have been a staple in town since 1943. Growing up in a bakery family, the six Stricker brothers worked right alongside their parents doing whatever odd jobs needed to be done: unloading trucks, bagging donut balls, cracking eggs, measuring shortening. “We were just slave laborers,” jokes brother Mark Stricker. Occasionally, their friends would wander inside and, channeling their inner Tom Sawyer, the brothers would enlist some help. “All the donut balls you can eat?” I’m in! For brother Todd, the youngest of the six, the bakery meant no fun after a Friday-night football game. Something about that bakery seems to have stuck with the Stricker brothers. Each has, in his own way, forged his career successes upon the lessons he learned working alongside Mom and Dad. At the intersection of baking, entrepreneurship, mechanics and hometown pride is where you’ll find these brothers, each having fun in his own way. The Stricker family’s baking experience began three generations ago along a stretch of Chicago’s North Avenue, where two families – the Strickers and the Planzers – ran separate bakeries. The Stricker family moved to Harvard, where they bought a farm and, for extra income, the Harvard Bakery. Their son Tony became a farmer. In 1945, the Strickers invited their Chicago friends, the Planzers, to join them in Harvard. The Planzers’ daughter, Shirley, eventually married Tony and together, the couple assumed the business from their parents. Tony and Shirley’s six boys – Kurt, Paul, Mark, Eric, John and Todd – would become the third generation to run the bakery. In 1967, the bakery made a move across the street, into a former grocery store, and was renamed Swiss Maid. Kurt, the oldest of the six, remembers working alongside his parents from an early age. Along the way, he learned not only baking but an entrepreneurial prowess. Of course, it meant occasional fun, too. “Growing up, we went to grade school across the street from the bakery,” recalls Kurt. “So, we went over for lunch, and Grandma or Mom would make lunch for us.” Sometimes it was pizzas in the ovens. “Or, we’d pick up some donuts and go back to school and trade,” adds Mark, brother No. 3. The going rate was two donuts for a baloney sandwich. By the time brother Todd, 16 years Kurt’s junior, started working, there was a well-oiled machine in place. Kurt left for college and a stint at the AIB International baking school in Manhattan, Kan., after which he returned to the family business. Then, in 1996, he set out to create a bakery and a business model all his own. Pedigree Ovens and The Pound Bakery manufactures about 60 wholesale products for private-label companies, with expertise in a variety of baked items, dog chews and dog supplements. Kurt figures he owes a lot to those “crazy dog mom” types, the kind who count Fido’s calories, address his food allergies and keep him gluten-free. 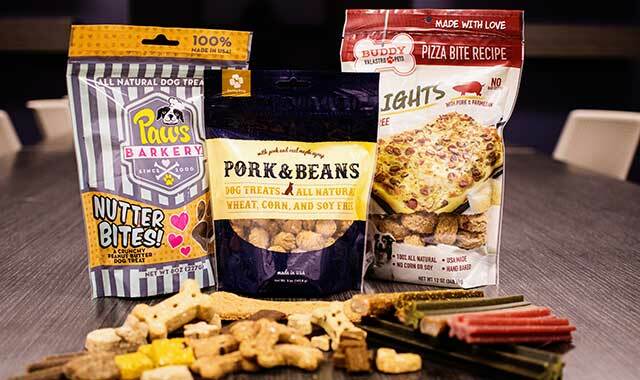 Dog moms and dads have been good to Kurt’s Pedigree Ovens and The Pound Bakery, helping the businesses to grow steadily into a major supplier of private-label dog treats and foods. Over the 20 years Kurt has been in business, the market for pet food and treats has exploded to nearly $70 billion, he estimates. Consumers are demanding higher-quality ingredients and manufacturing processes, and they’re looking for labels like “organic” and gluten-free. His experience in the family bakery helped Kurt to stay ahead of the times, in many ways. Kurt’s first factory, inside an old dairy building in Harvard, was nothing impressive. It didn’t even have air conditioning. But its main machine held a promise. Kurt had purchased it from an auction in Chicago, its former owner having gone bust while trying to make dog treats to human-grade standards. Those first biscuits were a trial-and-error process. In the early days, Kurt had six employees, a delivery route around local grocery stores and pet stores, and a break-even point at a few skids a week. Today, Pedigree Ovens and The Pound Bakery operates in a brand-new, 220,000-square foot factory in an industrial park on Harvard’s west side. Completed in 2017 and built by Stenstrom Construction Group, the building is nearly four times the size of the company’s previous facility. Longtime friends of the Stricker family, including Chadd Hartwig and Todd Streit of Hartwig Plumbing and Heating, and TK Norgard of Althoff Industries, also contributed to the new facility. New equipment at Pedigree Ovens and The Pound Bakery’s expansive new facility enables the production of several new lines of pet products. Inside, workers produce baked dog biscuits, meat chews, kibble, semi-moist treats, dehydrated blends and dental chews for about 150 clients and several in-house brands. Sarah Lund, director of marketing, estimates the company maintains about 60 wholesale product lines and a library of thousands of recipes. It manufactures mainly for private-label brands. 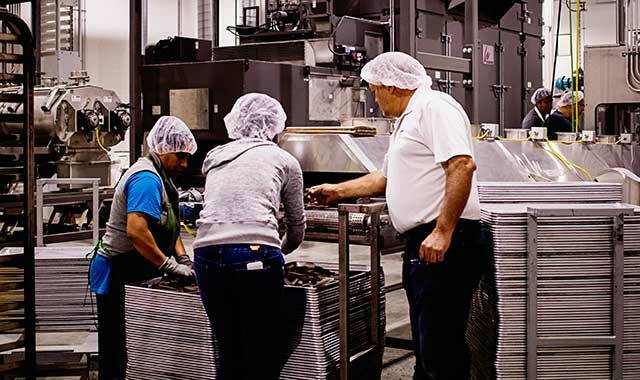 In keeping with consumer demands, Pedigree Ovens and The Pound Bakery maintains certifications in organic, SQF (food safety) and gluten-free food production, with processes in place for the requisite tracking of ingredients. The company’s new facility brings with it extra space for new production lines using hot and cold extrusion techniques. The former uses cooking methods to create products like dental chews. The latter process uses pressure alone to bond ingredients. Cold extrusion is especially useful in making products like probiotic treats and nutritional supplements, where some ingredients might otherwise be damaged by heat during a regular baking process. For years, Pedigree Ovens and The Pound Bakery distinguished itself by its use of human-like ingredients and manufacturing. But as that market grows more crowded, the company is adding new competitive advantages. Thanks to its new facility, Pedigree Ovens and The Pound Bakery has launched a department for graphic design and marketing services, including social media management, website design and product photography. The company’s former facility, a 50,000-square-foot center located down the street, now serves as a fulfillment center for clients’ business-to-consumer orders online. Just across an open field from Pedigree Ovens and The Pound Bakery, Kurt’s brothers Mark and Todd, along with a few friends, are busy concocting their own business opportunities. Inside an 11,000-square-foot former manufacturing center, Rush Creek Distilling is carving out a name for itself as a fun place to enjoy a locally crafted drink. Mark takes seriously the team’s mission to craft everything locally when possible. He counts among his supporters and suppliers numerous friends and colleagues. After he graduated from college, Mark never really returned to the bakery. With three of his brothers running things full-time, he figured it was already a packed house. For a few years, he worked the options exchange in Chicago, but the effects of “Black Monday” pushed him out. His brothers encouraged him to return home and manage the family’s real estate holdings. And until that business was sustainable, he could work odd jobs like bakery delivery. Along the way, he got into construction and developing real estate, including the industrial park owned by his family. Inside the park are the distillery, the pet food bakery and brother John’s manufacturing business. The running tagline is that four guys walked into a bar and came out with a distillery, but the truth is more complicated. There was, and it was already taking shape in partner Jeff McCarthy’s garage, inside a series of homemade stills. At parties and family get-togethers, the retired Air Force mechanic would share a few homemade drinks. The other founding members, Jay Nolan and Jim McConoughey, coalesced around the idea. In building their business, the partners turned to as many local connections as possible. Mark’s construction contacts renovated the interior. A local metalwork artist crafted components such as light fixtures, chandeliers, tables and bathroom sinks. The grains that feed Rush Creek’s whiskeys, bourbons, gins and vodkas are all crafted from corn raised on a Harvard family’s farm. Since it opened in July 2017, Rush Creek has been attracting notoriety among locals and out-of-towners. The team prides itself on an “adventurous spirit” that permits them to make “liberties to play,” says Mark, so the flavor profile is distinctive. Rush Creek’s taproom hosts live musicians on the weekends and creates a relaxing, party-like atmosphere. Patrons are invited to bring their own food or order carry-out from local restaurants. 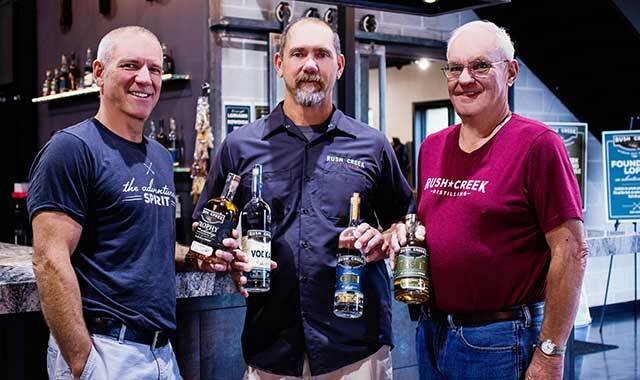 For those who’d prefer to enjoy a drink at home, the team has inked distribution deals that have placed Rush Creek products in select restaurants, liquor stores and supermarkets around McHenry County, Rockford and Chicago, with efforts to get into Wisconsin soon. Their distinct flavors are drawing a loyal following. Starting up a business from scratch has had its challenges. For example, how do you sell an aged whiskey when you’re a brand-new company? You buy somebody else’s. Rush Creek Distilling co-owner Jeff McCarthy is the team’s distilling expert. Before Rush Creek launched, McCarthy was casually making spirits with homemade stills in his garage. 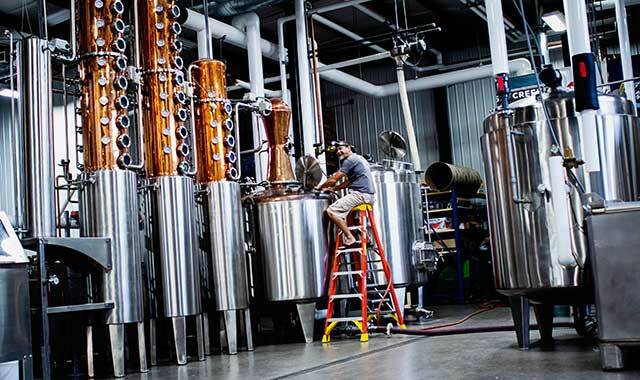 Regulations, tight as they can be at a bakery, can be even more excruciating for a distillery. And regulatory reporting can be just as crazy. This is where brother Todd comes in handy. A former plastics engineer and now a partner in Rush Creek, Todd handles special projects. In particular, Todd has put his engineering talents to work on technically challenging issues including regulatory reporting, product tracking and inventories. Mark just marvels over the spreadsheets his brother’s created. He grabs a clipboard with documents mapping every one of the whiskey barrels in house. Time is the ever-present challenge in this startup. Looking around the industrial chic interior of Rush Creek’s tasting room, Mark gets excited about what’s to come. He’s planning to add a patio out front and fix up the exterior to better reflect what’s on the inside. The partners are also devising a system of heat lamps for the patio that’ll burn the highly flammable “heads” that are a waste product of the distilling process. Todd never came back to work at the bakery when he graduated. Coming home covered in chocolate with flour in his ears didn’t appeal to him. Instead, he spent 15 years working in plastics engineering, with a focus on packaging. Once a month, he travels from his Florida home to Harvard. He does some work at Rush Creek and makes a few appearances at brother John’s business, just down the street. Brother No. 5 runs The Practical Baker, a company that manufactures, services and remanufactures bakery equipment, with a focus on smaller and medium-sized markets as well as grocery stores. Like Todd, John never returned to the bakery, instead following bleeding-edge internet technologies in the 1990s. John joined his dad in starting The Practical Baker in 1996, merging John’s experiences in websites and bakeries when he set up the company on bakery.com, a website he owns and still uses for marketing bakery equipment and industry knowledge. John inherited his father’s passion for tinkering, carrying on an interest in engineering and entrepreneurialism. He and his father acquired the Rhodes Kook-e-King machine company in 2004, bringing in house a company whose strongest seller is a device that portions cookie dough onto a baking sheet. The Strickers have made only modest improvements to the lineup. Adding to its capabilities, The Practical Baker recently acquired an aluminum foundry that was a former supplier. The foundry is now working with rapid prototyping and is expanding into additional product development – where Todd’s input has been helpful. Brothers Paul (No. 2) and the late Eric (No. 4) assumed control of Swiss Maid from their parents. The business was recently sold to a longtime friend. When they maintained the bakery, the brothers would occasionally piggyback on the buying power of Kurt’s Pedigree Ovens and The Pound Bakery. “We would buy by the truckloads, so they could buy it a lot cheaper from us and get it delivered from our suppliers,” says Kurt. Ask the Stricker brothers what it’s like working with family, and inevitably someone mentions the fights. In their younger years, it could mean back-alley brawls. But the boys have mellowed out with time. The next generation of Strickers is charting its own course, and it’s not necessarily toward the family businesses. Of Kurt’s three daughters – ages 32, 30 and 27 – none have come back to work at Pedigree Ovens and The Pound Bakery, although his son-in-law manages the new fulfillment center. Mark’s children, ages 28, 26, 23 and 20, have gone their separate ways, too, although he’s hoping to lure them in. He envisions bringing his older son into the real estate business and his oldest daughter into the distillery – which still doesn’t have any full-time employees. His youngest daughter helps in between her studies as a nursing student. Mark believes once his younger son finds a passion, he’ll help his dad, too. Can Mark envision them taking over some day? This entry was posted on Friday, August 17th, 2018 at 11:56 am	and is filed under Features, Top Posts. You can follow any responses to this entry through the RSS 2.0 feed. Both comments and pings are currently closed.